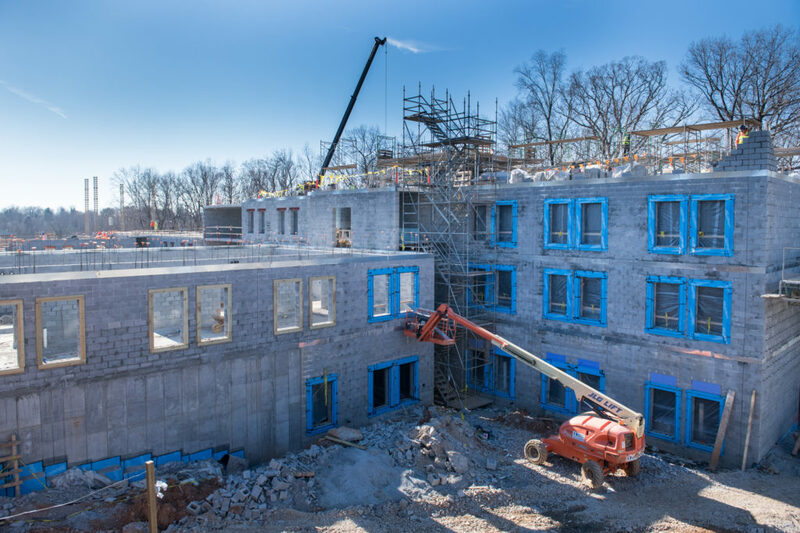 Despite the winter weather, including at least two snow events, crews working on the new residence hall have made significant progress over the past six weeks or so. Baird Taylor, site supervisor for construction firm Jamerson-Lewis, admitted the winter weather has “been a challenge” but said it hasn’t slowed progress on the project. “We worked through the holidays and have found ways to keep the job on track in spite of the bad weather,” he said. Metal stud framing is ongoing on the first and second floors. MEP (mechanical, electrical, plumbing) wall and overhead rough-ins are ongoing on the first floor. Cinder block walls have been completed up to the third floor. Precast plank, a concrete slab often used in the construction of multi-story buildings like residence halls, is being installed. Site work and window installation are ongoing. In the next six to eight weeks, Baird said, crews will begin installing trusses. Precast plank installation also will be completed. In February, crews will start spraying what Baird called an “foam air barrier,” which has to do with waterproofing and insulation. Also, according to Cooper, colors and materials have been chosen for the exterior.